Some have asked what can Africa learn from Greece. I argue that Greece (and others) can learn a lot from the African experience. Debt is on the rise again not just in Greece, but across the world. A decline in commodity prices with a strengthening of the US dollar makes debt unsustainable in many economies. These developments have led to rising proportions of government revenues being spent on debt servicing and debt accounting for higher and higher proportions of total GDP. The extremes of Greece, whose debt had risen to some 178% of GDP – probably more now as its economy has crashed – are rare, but the signs are ominous. Zimbabwe has a massive external debt, amounting to 40% of GDP, while other countries in the region – such as Mozambique and Tanzania – are racking up debt to fuel growth. But, as a timely new report by Jubilee Debt Campaign argues, such growth masks growing inequalities and huge liabilities linked to public private partnership deals. It also hides a debt servicing requirement that will squeeze public expenditure for many years. Is this a return to the 1980s and 1990s, when many countries across Africa – like Greece today – were saddled with unsustainable debt? Then, African countries had to take the unpalatable medicine of austerity packages imposed by the international financial institutions. Can Greece and other debt-vulnerable nations learn valuable lessons from this period and its aftermath? I think so. The new Greek finance minister, Euclid Tsakalotos, knows about these issues. He published a paper in the Journal of Development Studies in 1994 on the scope and limits of financial liberalisation in developing countries. He also argued in the Cambridge Journal of Economics for a commitment to values in economics. Robert Mugabe oversaw Zimbabwe dump growth with equity in favour of structural adjustment – but with disastrous consequences. In Africa, the International Monetary Fund (IMF) and World Bank austerity measures of the 1980s and 1990s were not put to a popular vote. Like in Greece, they would have been roundly rejected. Governments of all political persuasions were instead bullied into compliance with drastic structural adjustment measures. Zimbabwe is a good example. 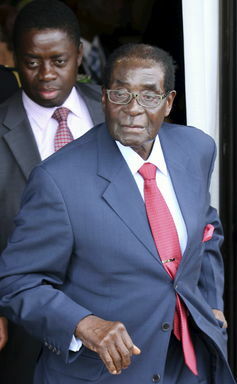 It abandoned its measured growth with equity strategy in 1991 in favour of the notorious Economic Structural Adjustment Programme (ESAP), known in Zimbabwe as the “Economic Suffering for African Peoples”. We know the consequences of this disastrous period, both economically and politically. But what if structural adjustment (aka austerity) across Africa had been replaced by a more balanced debt restructuring, encouraging investment alongside reform while protecting basic services and the vulnerable? There are lots of big what-ifs. But the damage imposed by austerity has been long-lasting – not only on economies and the lost decades of low growth, but also directly on people. These include those who missed out on an education, and with the decimation of health services, the impact of the HIV/AIDS epidemic unfolding across the continent at the same time was much, much worse. Lessons have been learned and in some quarters the Washington Consensus has been rejected. In the 2000s, the Highly Indebted Poor Countries debt release deals were linked to a focus on poverty reduction. For some countries in Africa it had a positive effect – even if this was only temporary. Escaping debilitating debt while promoting both growth and social justice is possible. This was the deal struck following the end of the second world war in Europe. Greece was one of the parties that signed the agreement to cancel German debt, and allow it to grow successfully after its decimation by war. The London Conference of 1953 was a key moment for Europe, sadly not being repeated by Brussels. As with Africa a few decades ago, Greece’s creditors continue to reject a long-term solution, and seem intent on humiliation, teaching a wayward country a lesson. The rhetoric of those involved is shocking. A few weeks back, the head of the IMF, Christine Lagarde, called for dialogue with adults in the room. African negotiators will recall how they were humiliated and demeaned by the international institutions who rejected pleas for a more balanced approach. They will have much sympathy with the Greeks today. Africa is now beyond the structural adjustment period. The Washington Consensus has been diluted, and there are new players – and new ideas – on the scene. Unlike Greece, African countries are not so behoven to a dominating power such as Germany, and less tied to a particular regional economic and political project. This is a good thing. Today across Africa, new perspectives are on the table, and not just the tired, old, failed medicine from the IMF and others. Most notably, new ideas – and finance – are coming from China, Brazil, India, Malaysia and South Korea – among others. A new state-led developmentalism is the flavour of the day. In Rwanda or Ethiopia a new African formulation of a developmental state is being forged. Others too are interested, including maybe Zimbabwe. They all draw insights and experience from the emerging nations, and notably China. Later this week, government representatives from across the world assemble in the Ethiopian capital Addis Ababa to discuss a financing for development, in advance of the signing of the UN Sustainable Development Goals in September. The conference document is full of high-sounding words, but the debates are framed in a very different way to those of the 1980s and 1990s. Sustainable finance, patient capital, long-term investment, balancing productivity with social protection are the watchwords. The document is much more Keynes than Friedman, and focuses on long-term sustainable development, not short, sharp shock treatment according to ideological disciplining and subjugation. 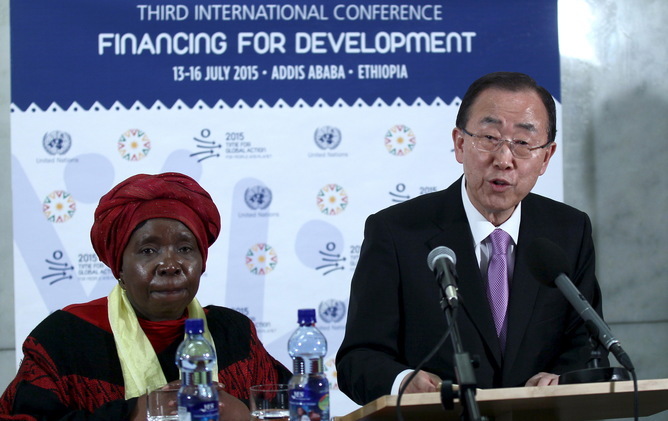 UN Secretary-General Ban Ki-moon and African Union Commission Chairperson Nkosazana Dlamini-Zuma. The UN discussions in Addis only touch on a small element of the wider picture. Financing from the BRICS is barely mentioned in the documents, yet the BRICS bank, the Asian Infrastructure and Investment Bank and the Chinese or Brazilian state investment banks are increasingly important players. So too are the huge private investment flows, as global capital restructures with Africa firmly in its sights. Balancing these investments, offsetting risks and avoiding unsustainable debt will be a tricky balancing act for all African governments in the coming years as commodity-led growth tails off. Greece, as well as many countries in Africa, have suffered the long-term consequences of a combination of structural underdevelopment, oligarchic corruption and patrimonialism and poor economic governance. Finding a way out of the bind without succumbing to more pain and suffering will be tough, requiring new ideas and new allies. This article draws from a piece originally published on the Zimbabweland blog. Ian Scoones is Director of the ESRC STEPS Centre and a Professorial Fellow, Institute of Development Studies at University of Sussex.